Comm Eye Health Vol. 12 No. 32 1999 pp 55 - 56. Published online 01 December 1999. The new Global Initiative by the World Health Organization has an ambitious goal of eliminating blinding trachoma by 2020, twenty years into the next millennium. GET 2020 consists of a four-pronged strategy to reduce active trachoma through community-based antibiotic distribution and health education on face washing and environmental sanitation, and to reduce vision loss from trichiasis through provision of appropriate surgical services. The SAFE strategy – Surgery, Antibiotics, ace-washing, Environmental change – is currently being implemented or planned for five pilot countries where the antibiotic component will be based on the drug azithromycin under a donation programme by Pfizer, Inc.
Azithromycin represents a breakthrough for the community-based, antibiotic treatment of ocular Chlamydia Trachomatis infection. Trachoma is a community disease, which clusters in neighbourhoods and within families, children having the highest rates of disease.1Treatment of a few cases in such a setting guarantees re-infection from familial or neighbourhood sources, unless the treatment is more widespread. Moreover, re-infection from extra-ocular sites can occur if only topical treatment is used,2 and re-infection from other people can occur if treatment of members of the community is not carried out at the same time. Previously, topical agents, such as tetracycline, have been the agents of choice. This was done due to the absence of systemic side effects in children (seen with oral tetracycline) and the high cost and lack of availability of oral erythromycin in many of these remote communities. However, topical tetracycline must be used every day for four to six weeks to be effective. It also stings, is messy to use, and results in blurred vision because of its oily base. Compliance (regular use of the prescribed medicine) with topical agents is typically quite poor. Azithromycin, on the other hand, has been shown to be effective against C. trachomatis with one dose administered orally.3,4 Azithromycin is in the azalide class of antibiotics. It has unique pharmacokinetic properties that make it ideal for treating trachoma; good oral bioavailability and distribution to tissues, sustained high tissue levels with low protein binding, and high intracellular concentration which is important in treating Chlamydia Trachomatis.3 Serum, aqueous and tear samples collected 4 days after azithromycin administration showed pharmacologically active concentrations, and conjunctival specimens continued to have high levels 14 days after administration.6 The safety of a three dose regimen (once per week for three weeks), or single dose, has been demonstrated in clinical trials.3,4,7 Side effects include occasional mild gastrointestinal upset, and cases of nausea, vomiting and diarrhoea, although, in large clinical trials, few side effects were eported. Azithromycin has been shown to be effective in clinical trials which randomised those with active disease to either topical tetracycline or azithromycin. Under research conditions, compliance with both therapies was good, and the decline in disease was equivalent in both groups. These data led to support for a large, community based randomised trial in three countries, to determine the long term effect on trachoma at the community level of mass treatment with azithromycin, compared to tetracycline.7 At one year post treatment, both clinical disease and laboratory evidence of infection in the community were reduced in both groups with evidence of a greater reduction in villages treated with azithromycin. Administration of the drug, and monitoring of compliance was considerably easier with azithromycin, compared to tetracycline topical ointment, The results of these studies have clearly identified that azithromycin offers an important new weapon in antibiotic intervention for trachoma control. The enthusiasm for the use of this drug for trachoma control is very high, which has raised a new set of difficult questions. First, the drug is very expensive, prohibitively so for countries where trachoma control is important. At present, Pfizer has selected only five countries in which to test their donation programme, and other countries are not eligible to receive the drug without charge, except for research purposes. While other countries can proceed with topical antibiotics as part of their programme, the issues of compliance and likely coverage remain a problem. Second, the widespread use of oral azithromycin has raised concern for the potential development of resistant strains of C. trachomatis, as well as other sensitive organisms such as S. pneumoniaeu. While the development of resistance, based on a once-per-year treatment may be unlikely, this possibility needs to be addressed. Third, azithromycin has not been approved for use in pregnant women by the Food and Drug Administration in the United States (based not on concerns for safety, but on the absence of studies. Erythromycin, a similar antibiotic, is approved for use in pregnant women). Women are at increased risk of active infection because of their care taking activities with young children. If compliance is inadequate with topical preparations, women may form a significant source of re-infection of the community. Each country programme must currently weigh the risks and benefits of using azithromycin for treating active disease in pregnant women. Operations research projects underway in Tanzania, Nepal, Morocco and Mali are addressing questions of the effect on communities of targeting treatment to individuals or families, as opposed to mass treatment. Infections which are not obvious on clinical examination have been reported as high as 30% in The Gambia and Egypt. 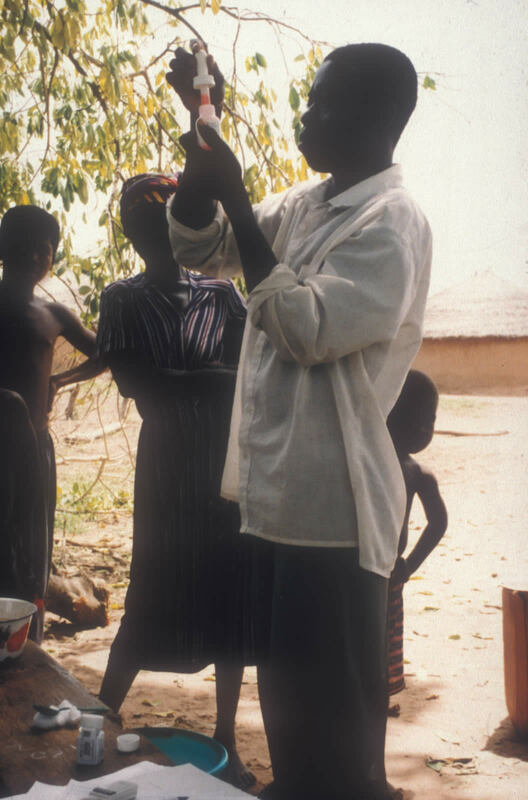 If treatment is restricted to those with clinically apparent disease, the impact on trachoma over time in the community of not treating these cases is unknown. Alternative strategies for mobilising communities to ensure high coverage rates are also being tested. Such research has high priority for showing programmes ways to use scarce resources effectively for the long term control of trachoma in their communities.